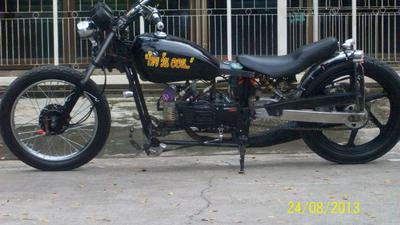 I Recycled My damaged Suzuki Crystal 110cc Electric start. Proceeded to Built a Dom tubed Chopper frame. I Recycled recycled everything. Used Honda front fork, 18" spoke wheel, Suzuki Head tube, My own Custom Welded Frame. Honda Phanton Tank and shift/brake linkage. NSR150 Honda Complete Rear Suspension (Fork, disc brake, 18" wheel) 4 speed and used Final Ratio 15/35. Here in Thailand it is very expensive to get big Bike now either Importers charge whatever they want (since not Factory) or you pay 300% Import tax if you have owned less then 5 years. If you can prove ownership license and title in your name. They ask, "And why, are you here?" I just smile as Dumb question, does not even deserve a dumb answer! So I desided to use what I had here and could buy at shops. First to prove that it could be done (Recycle) and it was feasable to do. I used the Miller Dynomo Bicycle light set from my 1st Bike in Seattle, 50 years ago. I used Headlight and Tail light cases. Changed bulb holder in Headlight to M/C 25w/25w and also added Halogen 12V6w original style bulb to be located in Low beam position. To be lit when in High Beam (gave me additional width to beam in front of bike 10-15 meters). Replaced bulbs in rear to 1 - 3w LED in center for tail light and 5 - 3w in star pattern for brake light. Wheel base is 65.5", Seat height is 23.5" from pavement and leg stretch is sufficent for 6'1" adult. Total cost from start to finish (w/ some new; Some refurbish parts) 14,000 Baht = $437.50 total) Actually was less because Baht was done in the 29-31 exchange rate. It proves you can do anything you want when you have the idea and the will to stay at it. Very Good.